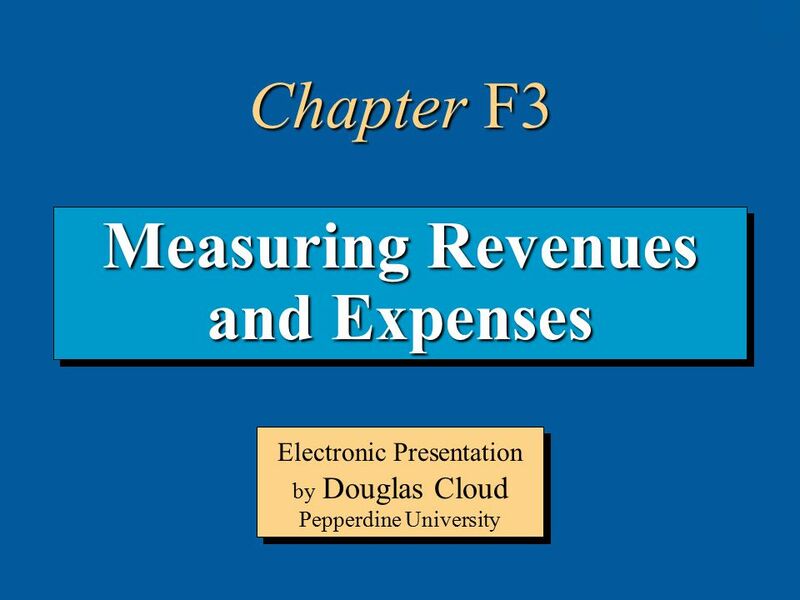 3-1 Measuring Revenues and Expenses Electronic Presentation by Douglas Cloud Pepperdine University Chapter F3. 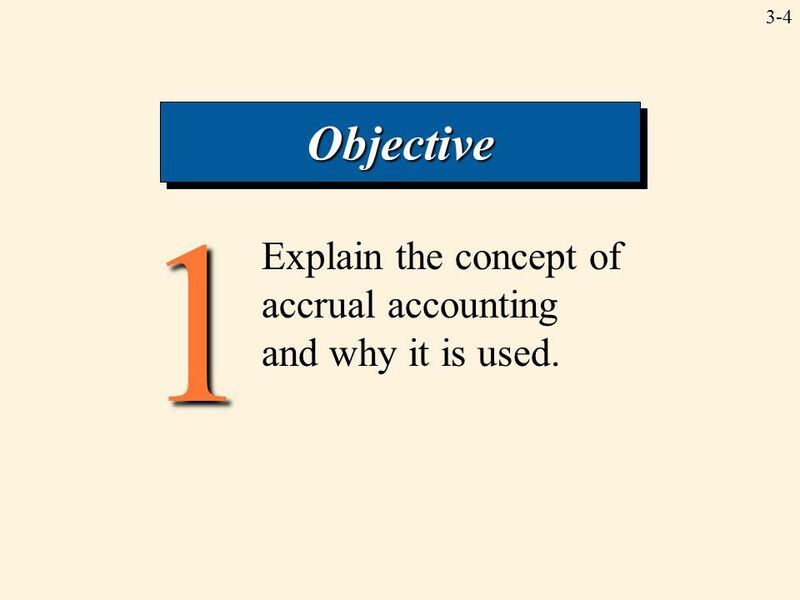 4 3-41 ObjectiveObjective Explain the concept of accrual accounting and why it is used. 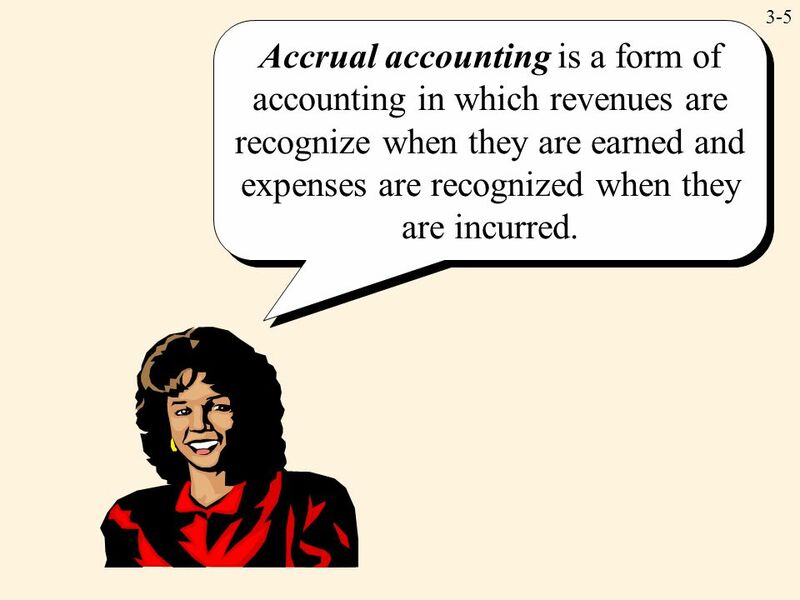 5 3-5 Accrual accounting is a form of accounting in which revenues are recognize when they are earned and expenses are recognized when they are incurred. 8 3-8 Revenue Transactions ASSETS = LIABILITIES + OWNERS’ EQUITY + OWNERS’ EQUITY Date Accounts Cash Other Assets Contributed Capital Retained Earnings 2/12Accts. 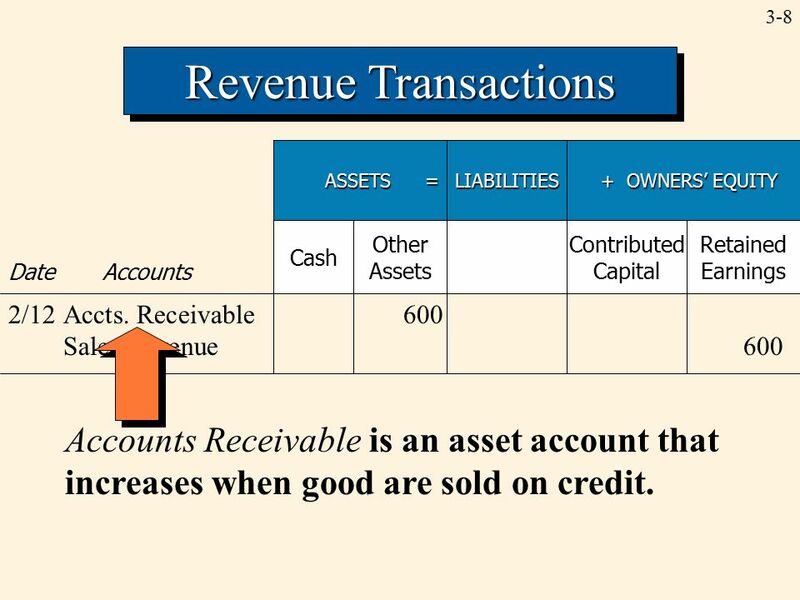 Receivable600 Sales Revenue600 Accounts Receivable is an asset account that increases when good are sold on credit. 9 3-9 Revenue Transactions ASSETS = LIABILITIES + OWNERS’ EQUITY + OWNERS’ EQUITY Date Accounts Cash Other Assets Contributed Capital Retained Earnings 2/12Accts. 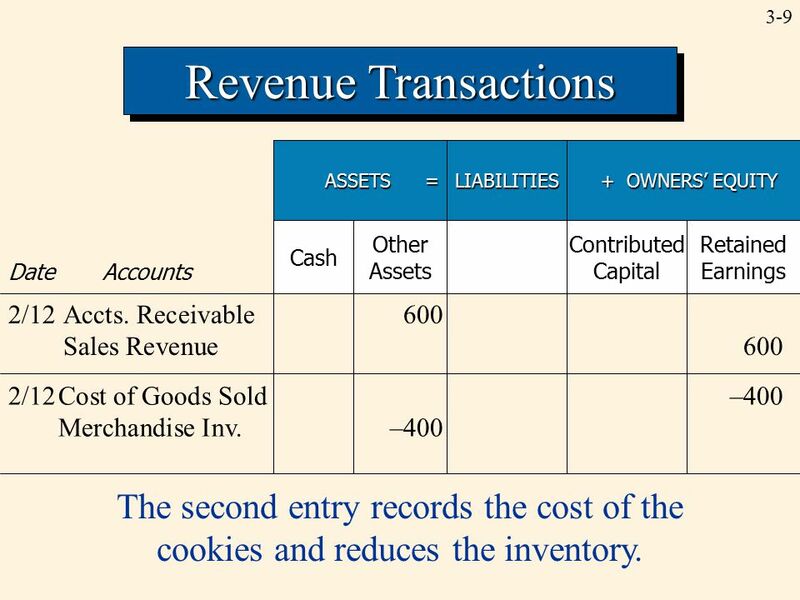 Receivable600 Sales Revenue600 2/12Cost of Goods Sold–400 Merchandise Inv. 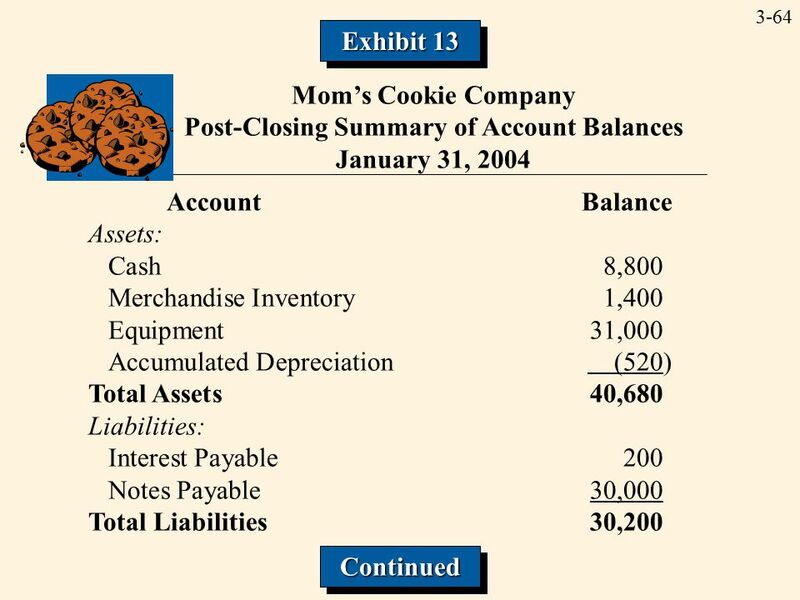 –400 The second entry records the cost of the cookies and reduces the inventory. 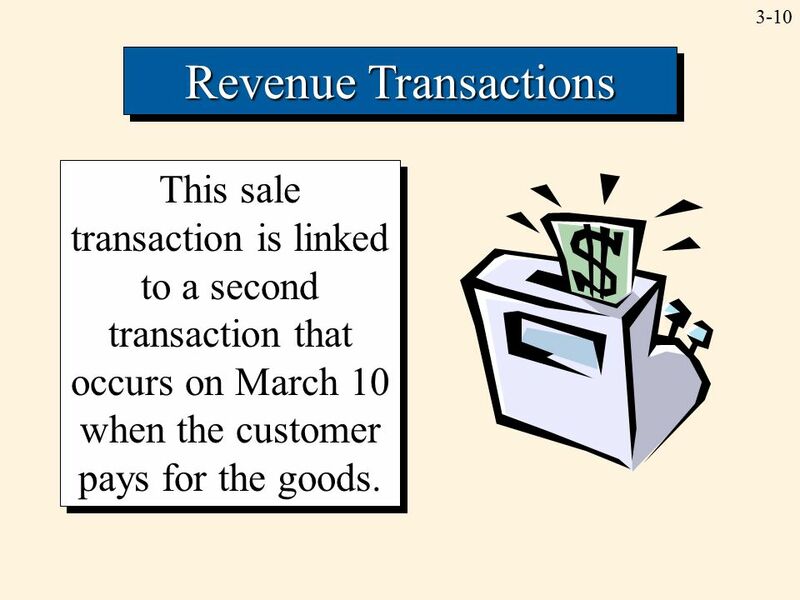 10 3-10 Revenue Transactions This sale transaction is linked to a second transaction that occurs on March 10 when the customer pays for the goods. 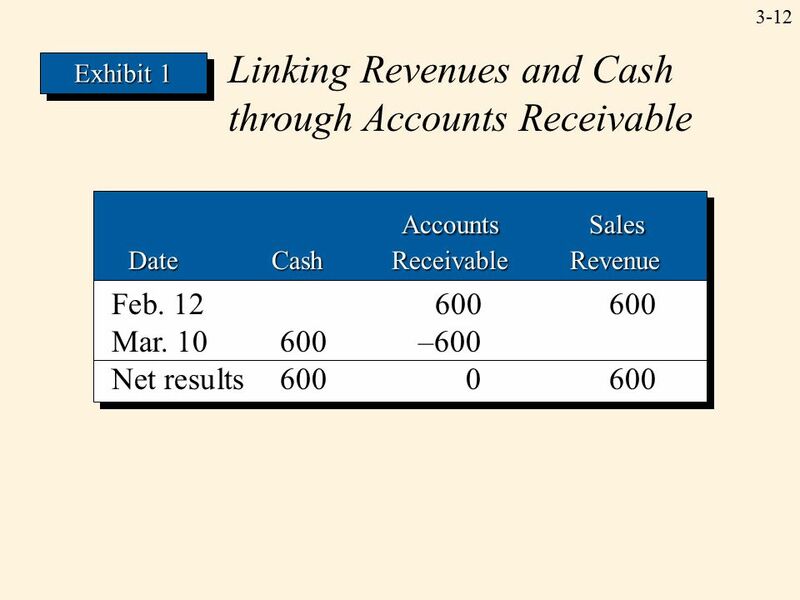 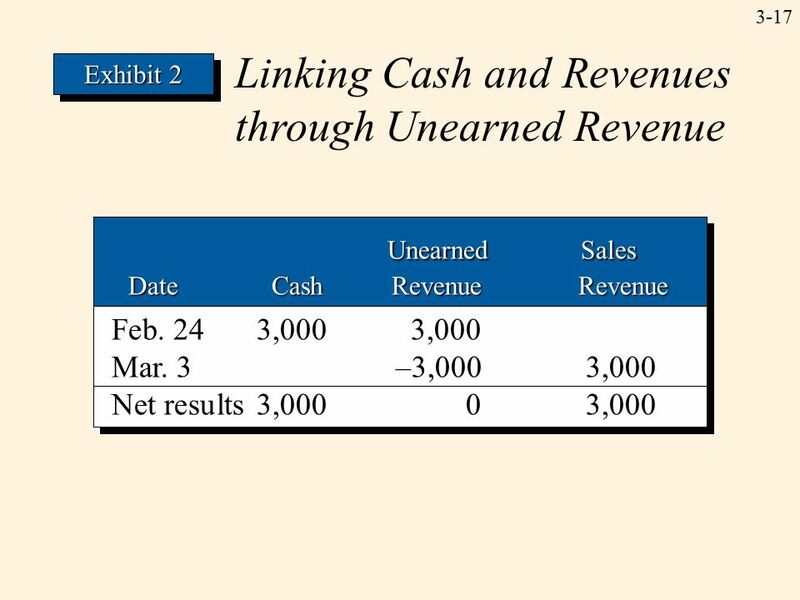 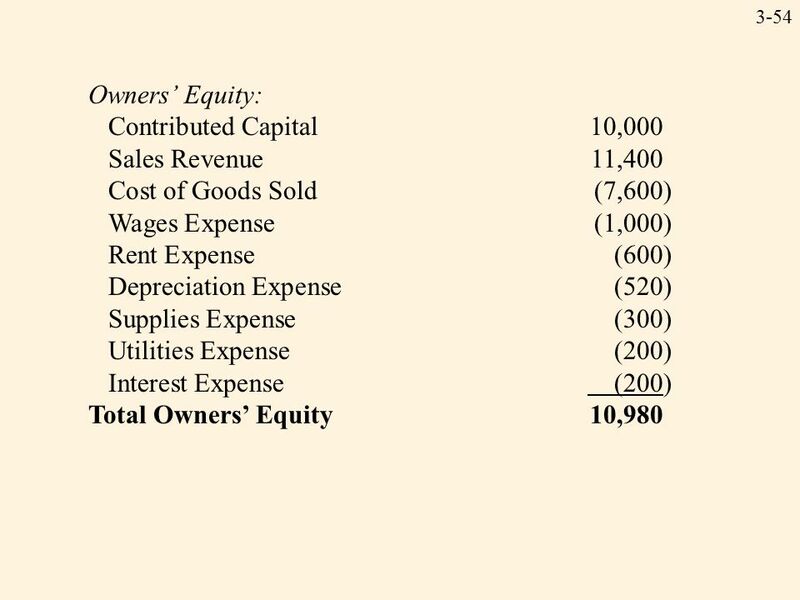 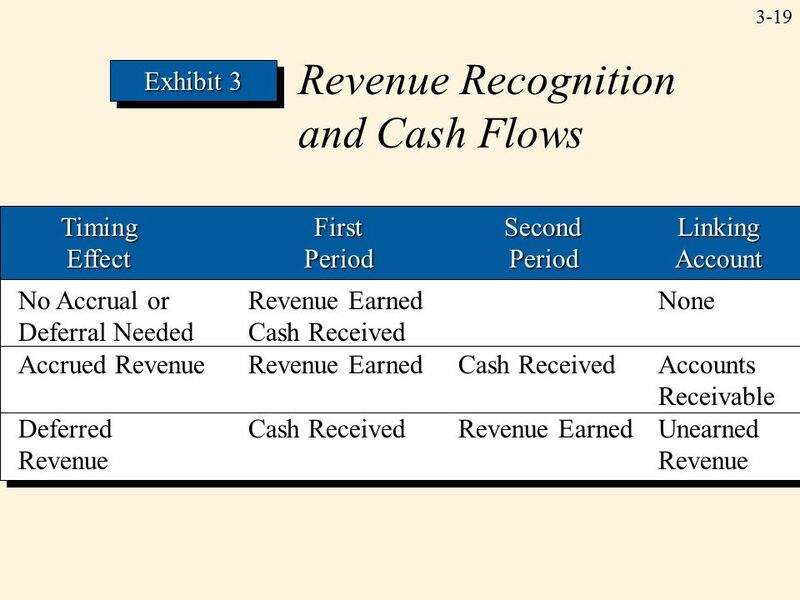 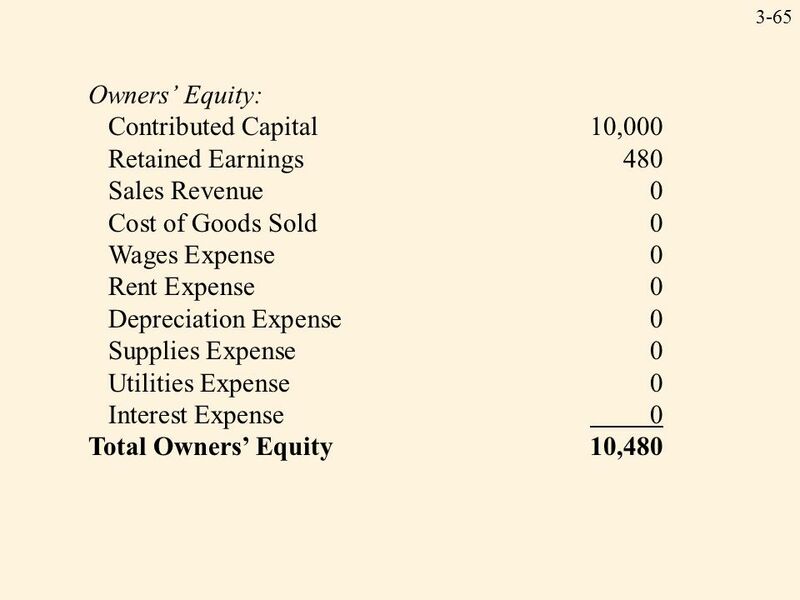 11 3-11 Revenue Transactions ASSETS = LIABILITIES + OWNERS’ EQUITY + OWNERS’ EQUITY Date Accounts Cash Other Assets Contributed Capital Retained Earnings 3/10Cash600 Accts. 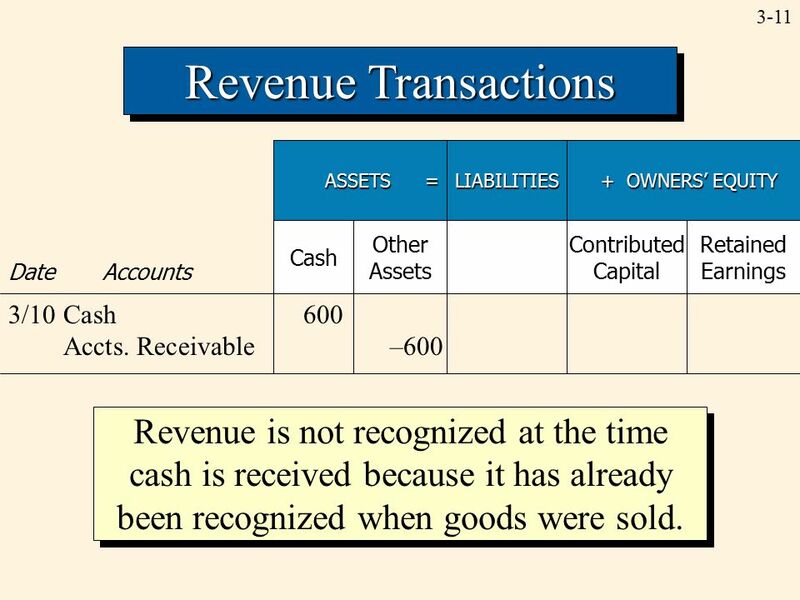 Receivable–600 Revenue is not recognized at the time cash is received because it has already been recognized when goods were sold. 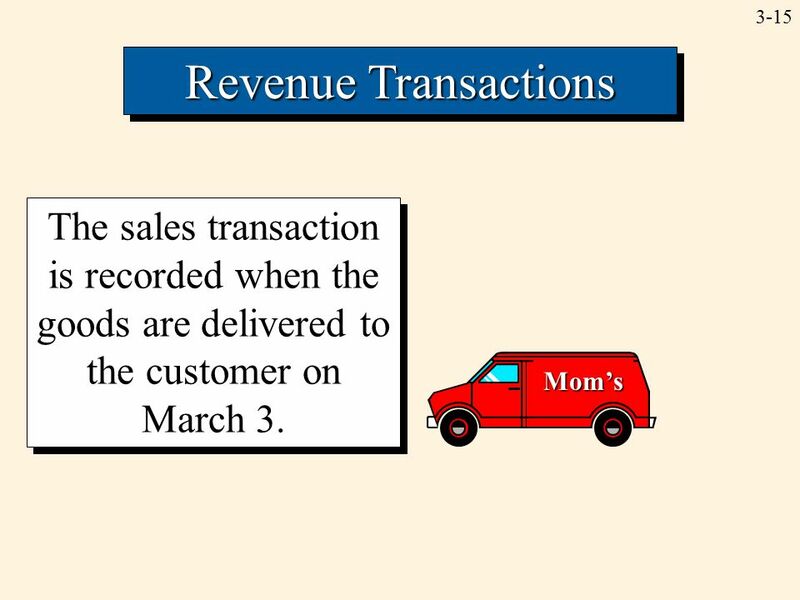 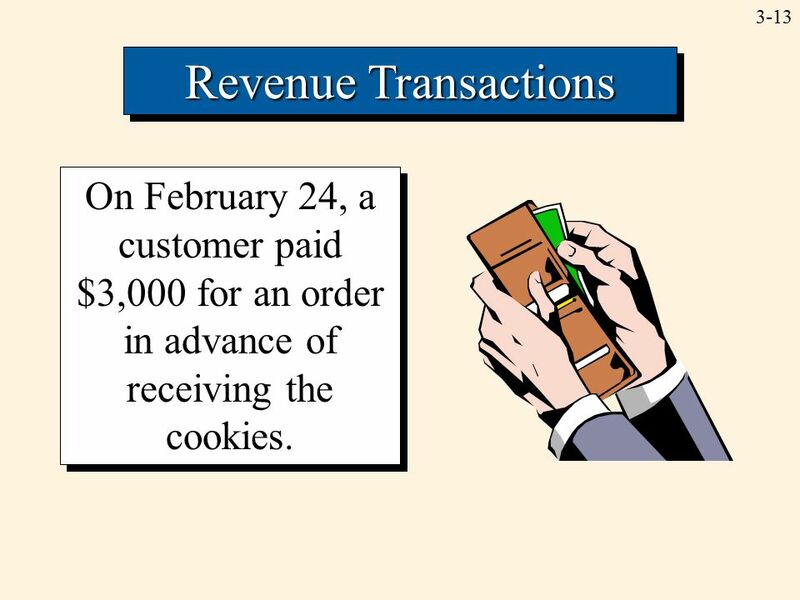 13 3-13 Revenue Transactions On February 24, a customer paid $3,000 for an order in advance of receiving the cookies. 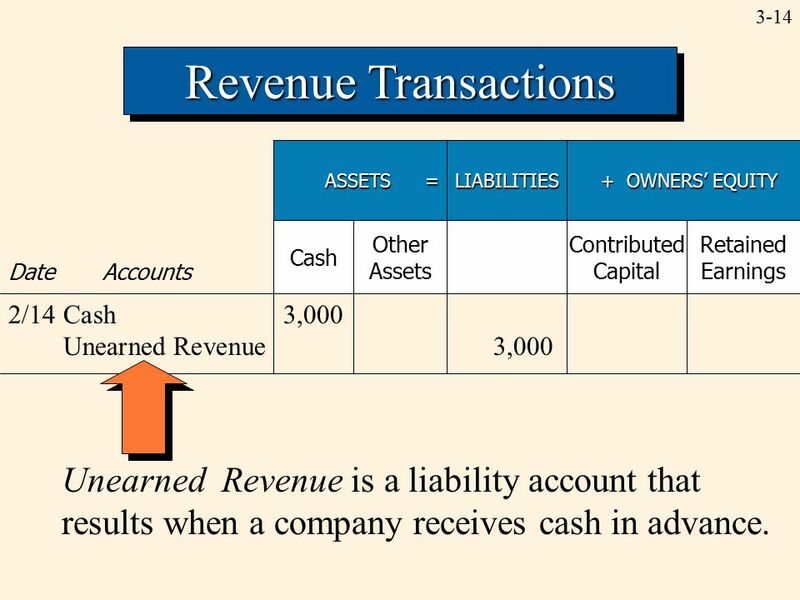 14 3-14 Revenue Transactions ASSETS = LIABILITIES + OWNERS’ EQUITY + OWNERS’ EQUITY Date Accounts Cash Other Assets Contributed Capital Retained Earnings 2/14Cash3,000 Unearned Revenue3,000 Unearned Revenue is a liability account that results when a company receives cash in advance. 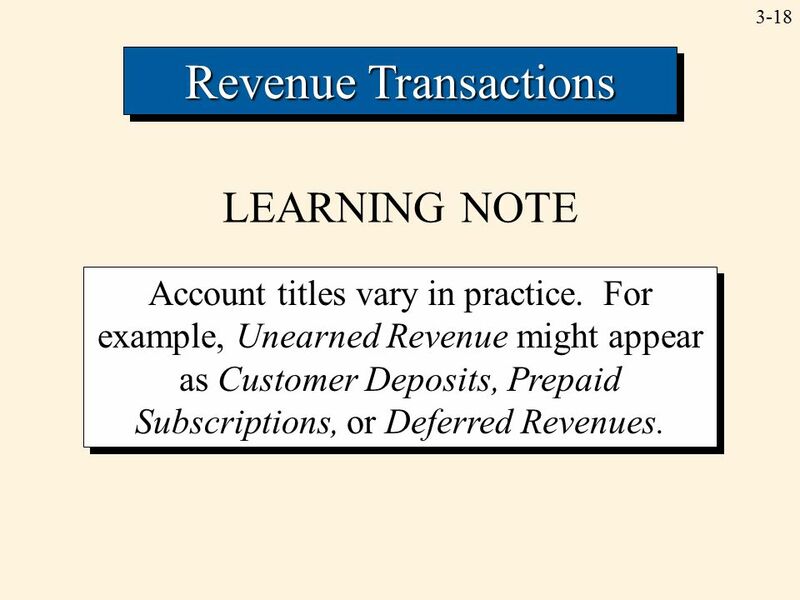 18 3-18 Revenue Transactions LEARNING NOTE Account titles vary in practice. 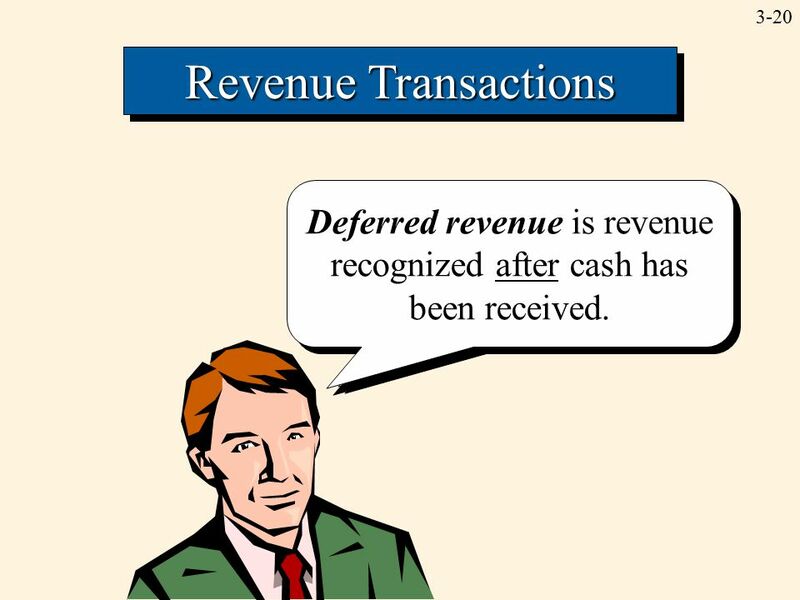 For example, Unearned Revenue might appear as Customer Deposits, Prepaid Subscriptions, or Deferred Revenues. 22 3-22 Expense Transactions Accrued expenses result when expenses are recognized prior to the payment of cash. 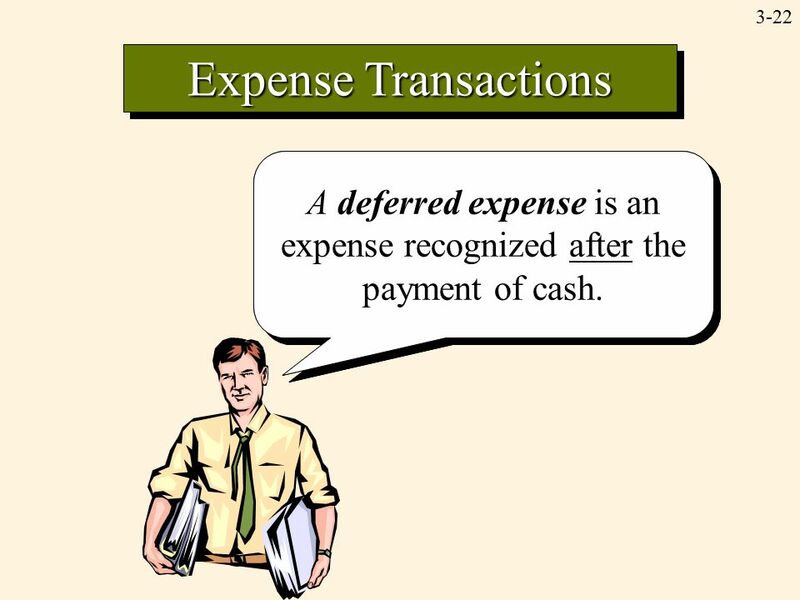 A deferred expense is an expense recognized after the payment of cash. 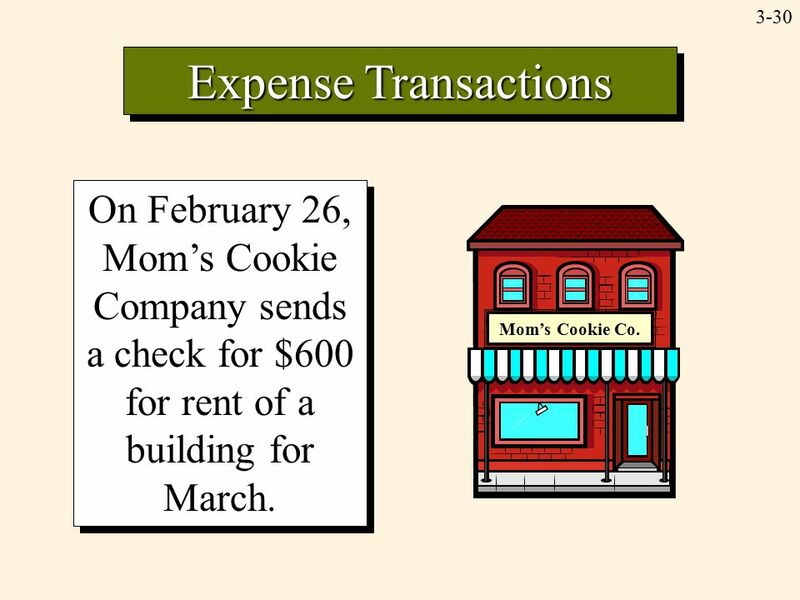 30 3-30 On February 26, Mom’s Cookie Company sends a check for $600 for rent of a building for March. 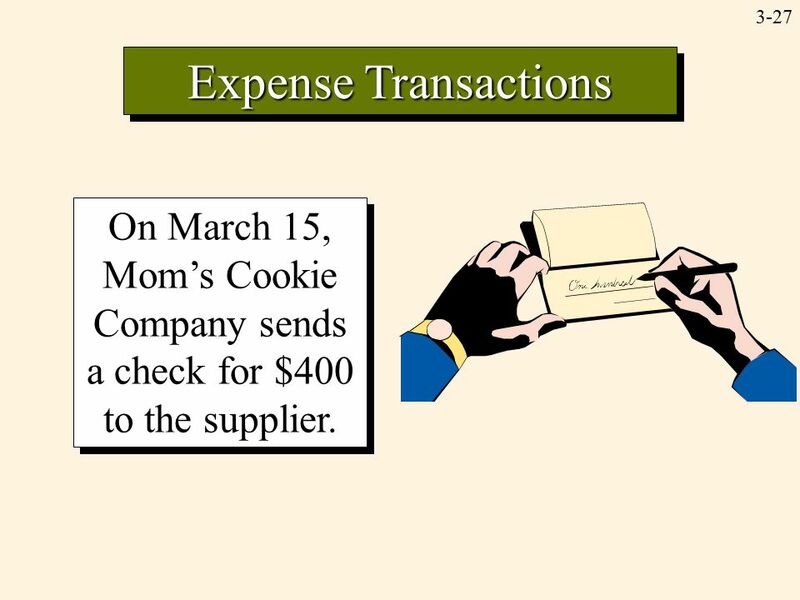 Expense Transactions Mom’s Cookie Co.
31 3-31 Expense Transactions ASSETS = LIABILITIES + OWNERS’ EQUITY + OWNERS’ EQUITY Date Accounts Cash Other Assets Contributed Capital Retained Earnings 2/26Prepaid Rent600 Cash–600 Prepaid Rent is an example of a prepaid expense, which is an asset account that identifies resources that have been paid for but not used. 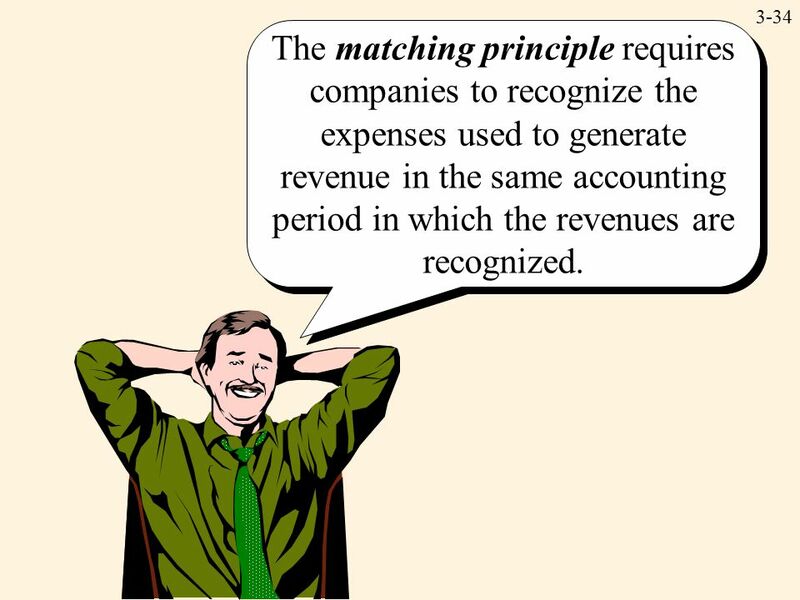 34 3-34 The matching principle requires companies to recognize the expenses used to generate revenue in the same accounting period in which the revenues are recognized. 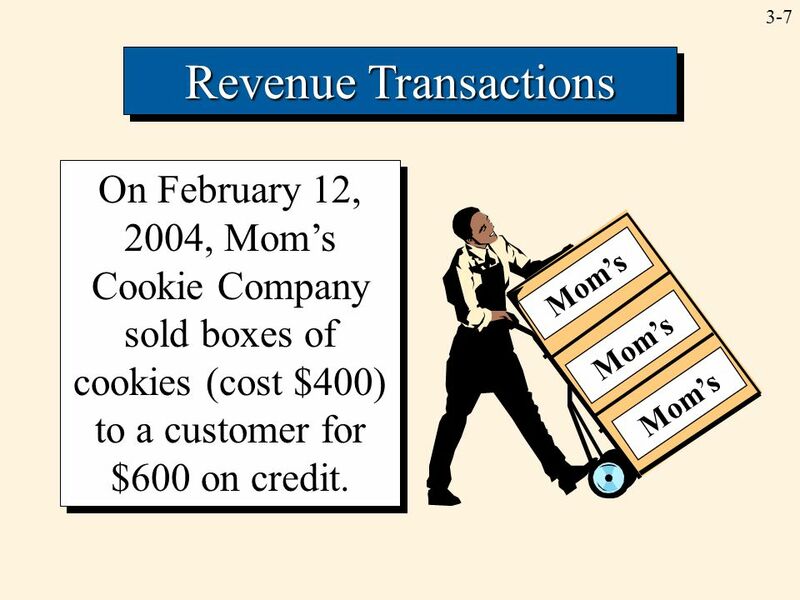 37 3-37 Mom’s Cookie Co. 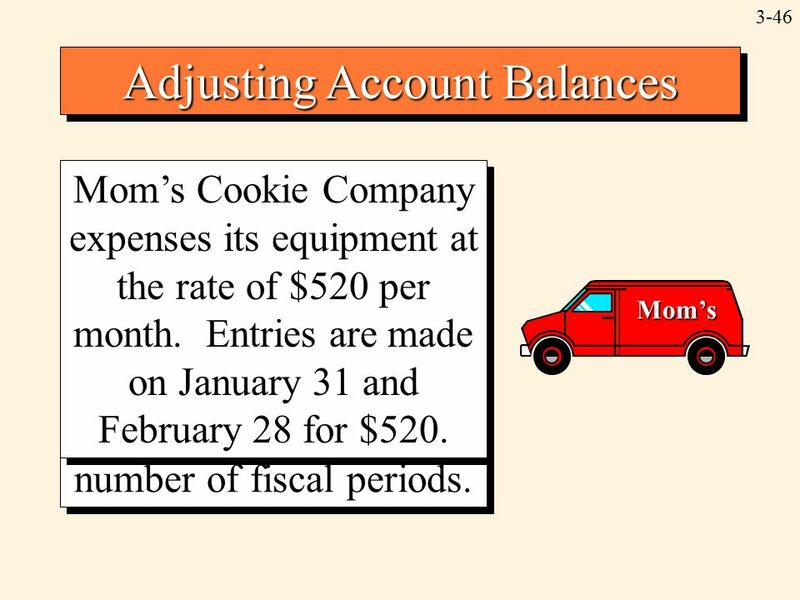 Adjusting Account Balances In mid-February, Mom’s Cookie Company decides to move to a new building on March 1. 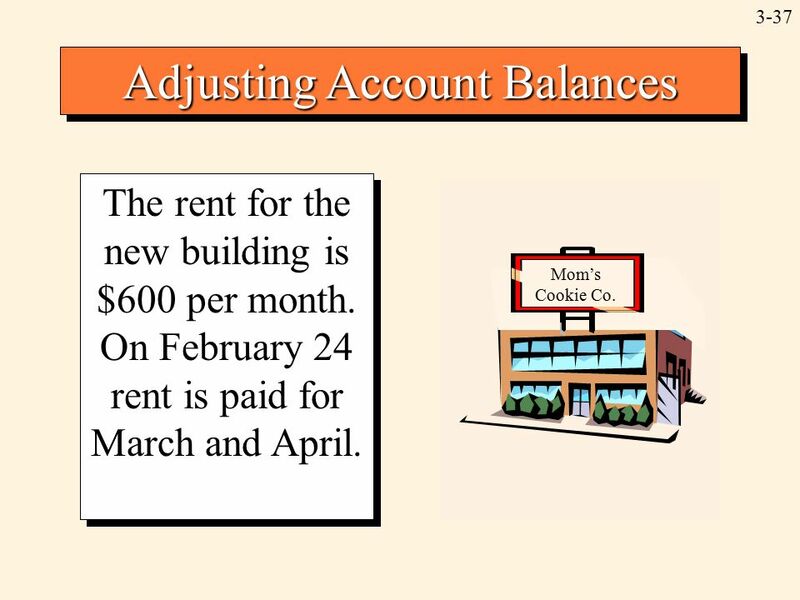 The rent for the new building is $600 per month. 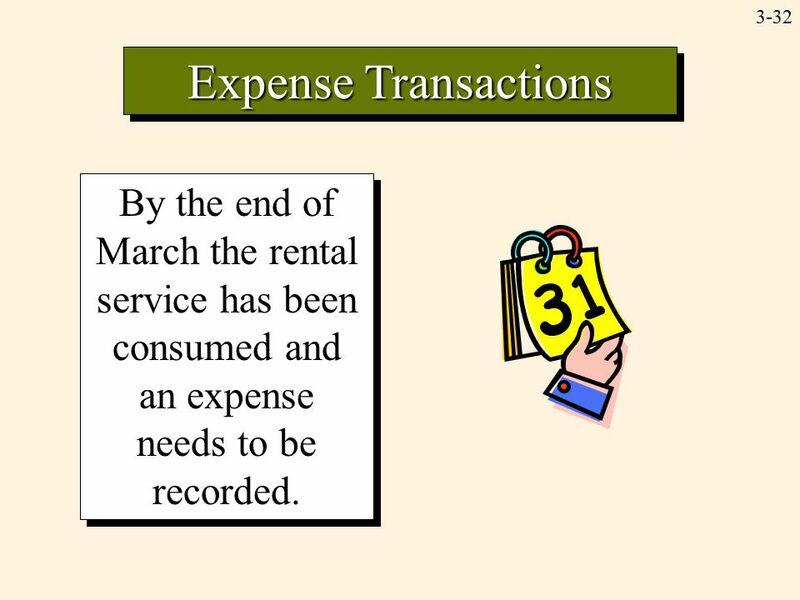 On February 24 rent is paid for March and April. 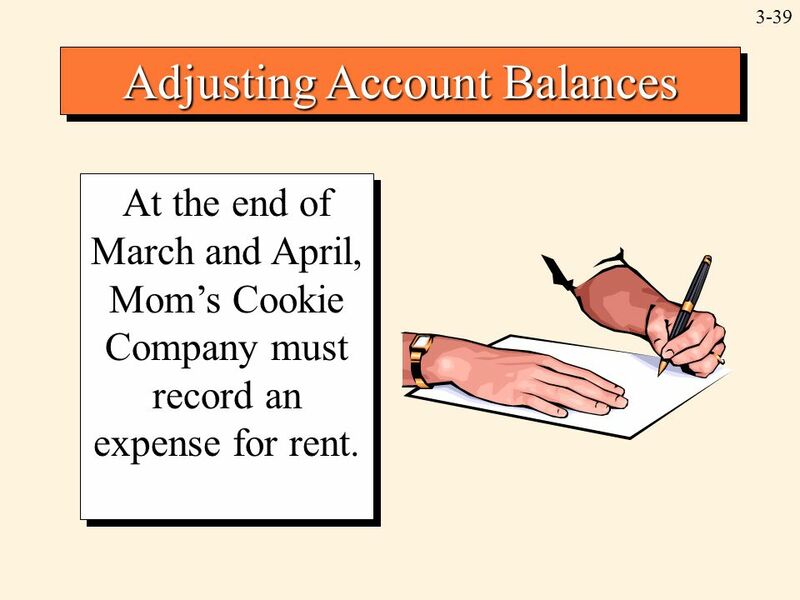 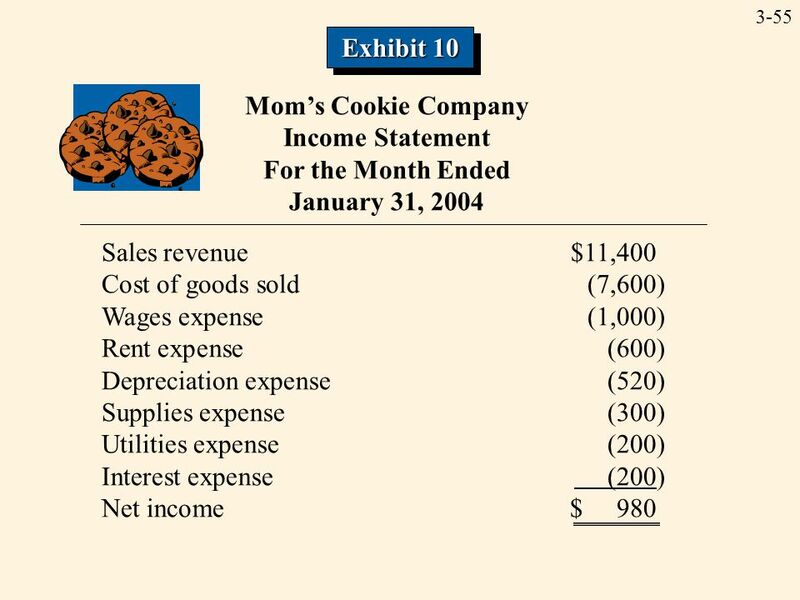 Mom’s Cookie Co.
39 3-39 Adjusting Account Balances At the end of March and April, Mom’s Cookie Company must record an expense for rent. 40 3-40 Adjusting Account Balances ASSETS = LIABILITIES + OWNERS’ EQUITY + OWNERS’ EQUITY Date Accounts Cash Other Assets Contributed Capital Retained Earnings 3/31Rent Expense–600 Prepaid Rent–600 4/30Rent Expense–600 Prepaid Rent–600 An adjusting entry is a transaction recorded in the accounting system to ensure the correct account balances are reported for a particular fiscal period. 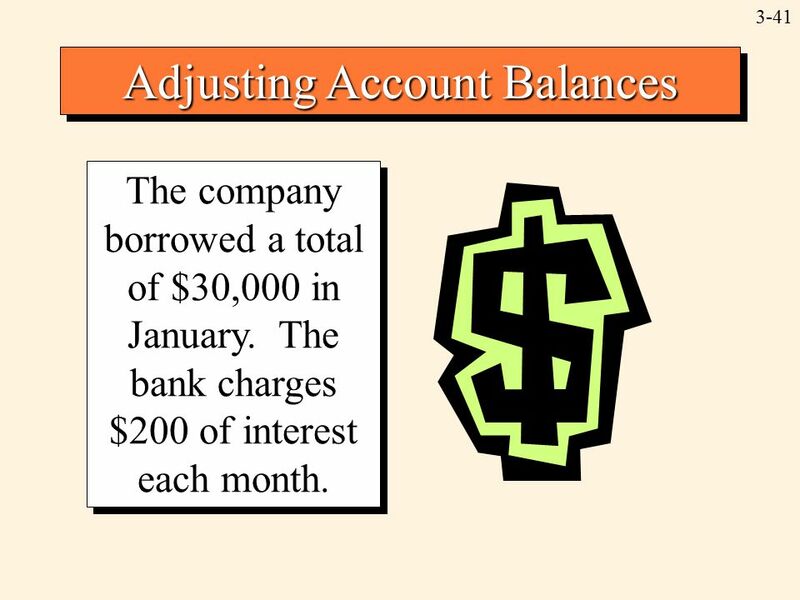 41 3-41 Adjusting Account Balances The company borrowed a total of $30,000 in January. 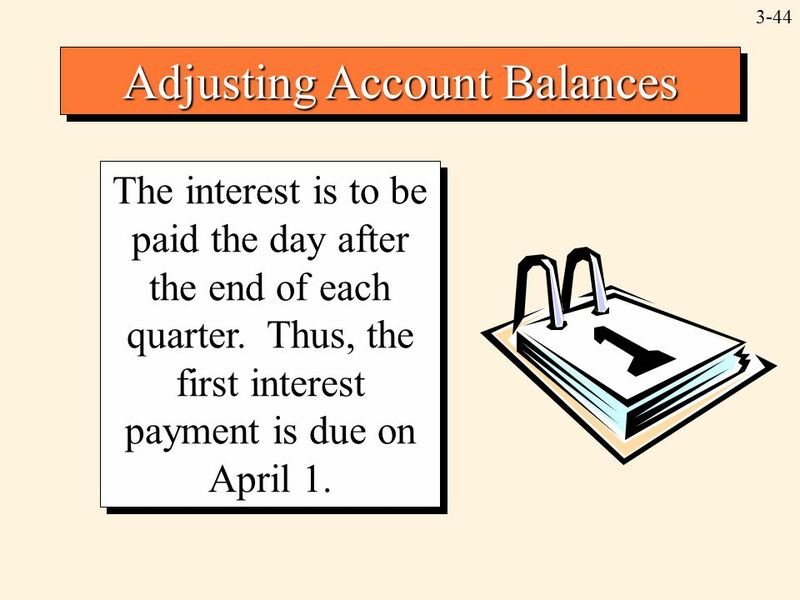 The bank charges $200 of interest each month. 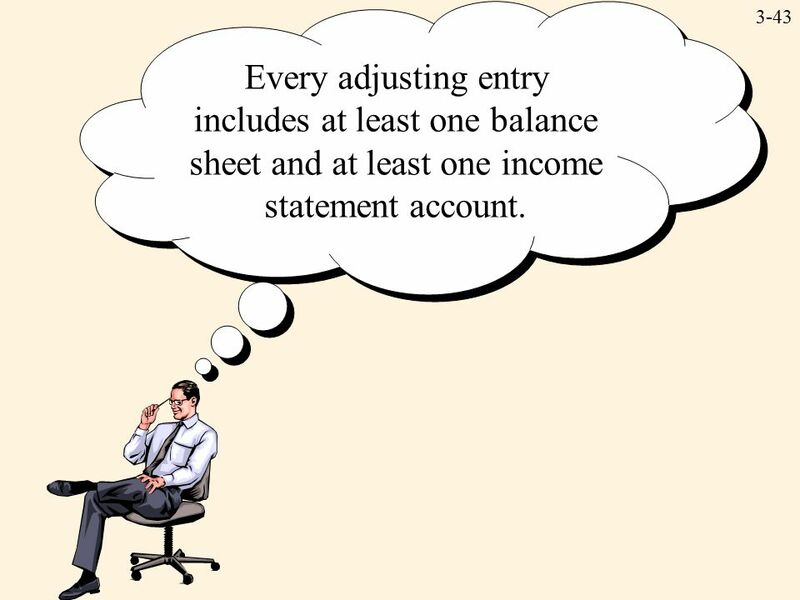 43 3-43 Every adjusting entry includes at least one balance sheet and at least one income statement account. 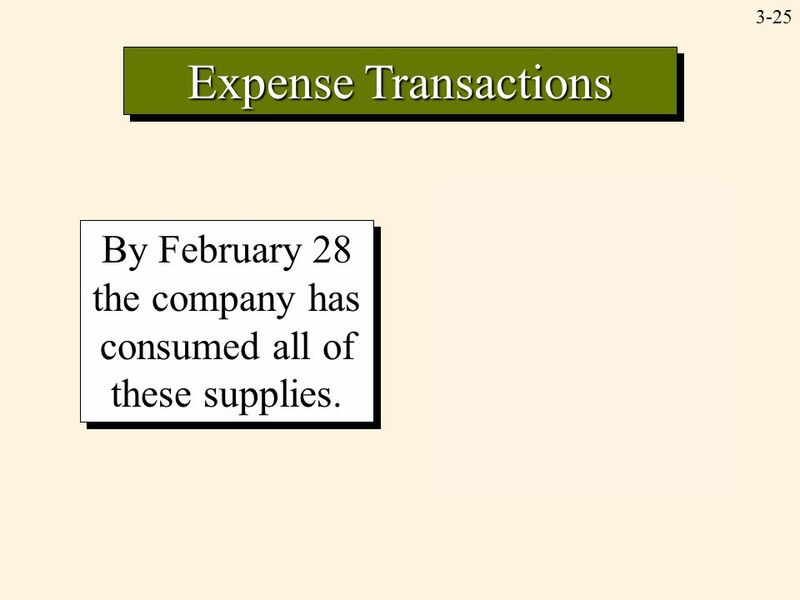 46 3-46 The company purchased equipment in January at a total cost of $31,000. 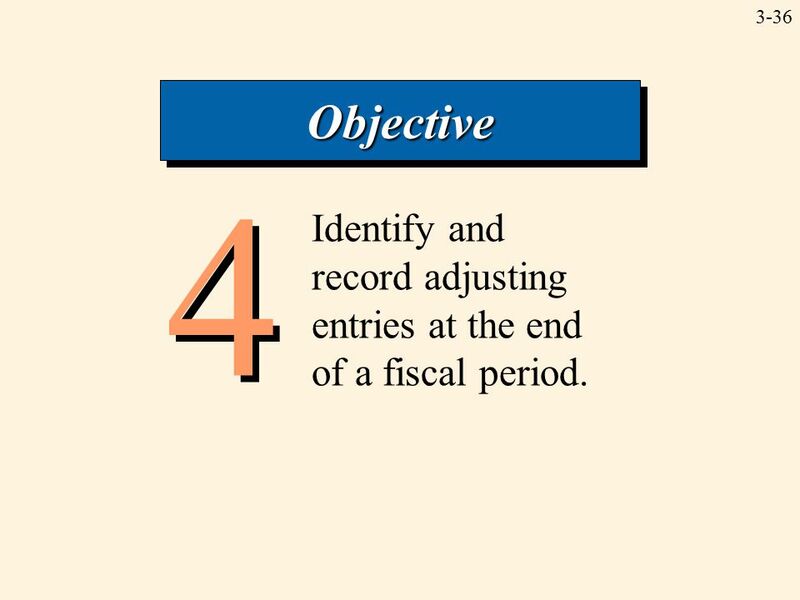 The usage of this equipment should be recognized over a number of fiscal periods. 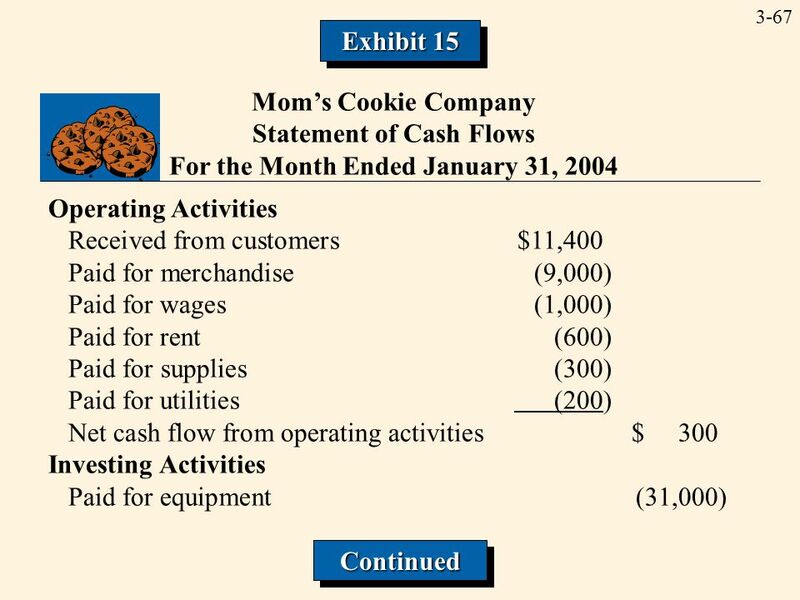 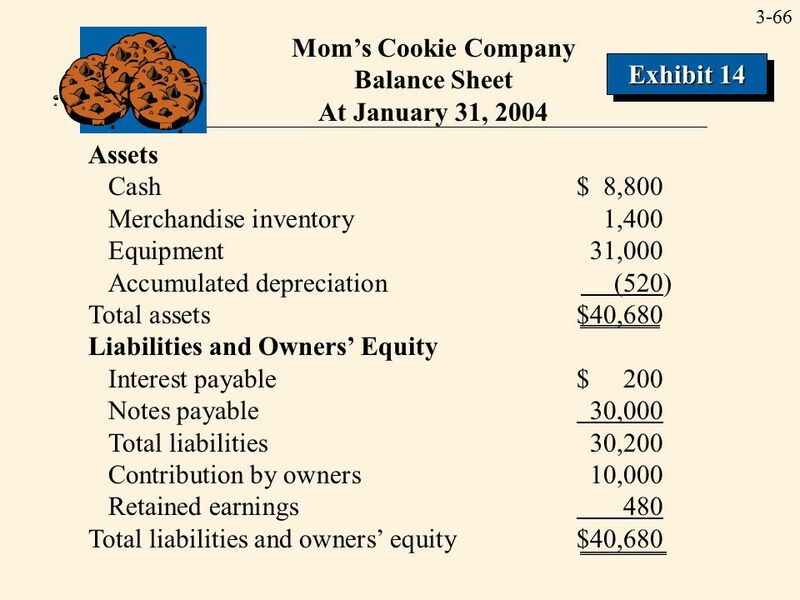 Adjusting Account Balances Mom’s Mom’s Cookie Company expenses its equipment at the rate of $520 per month. Entries are made on January 31 and February 28 for $520. 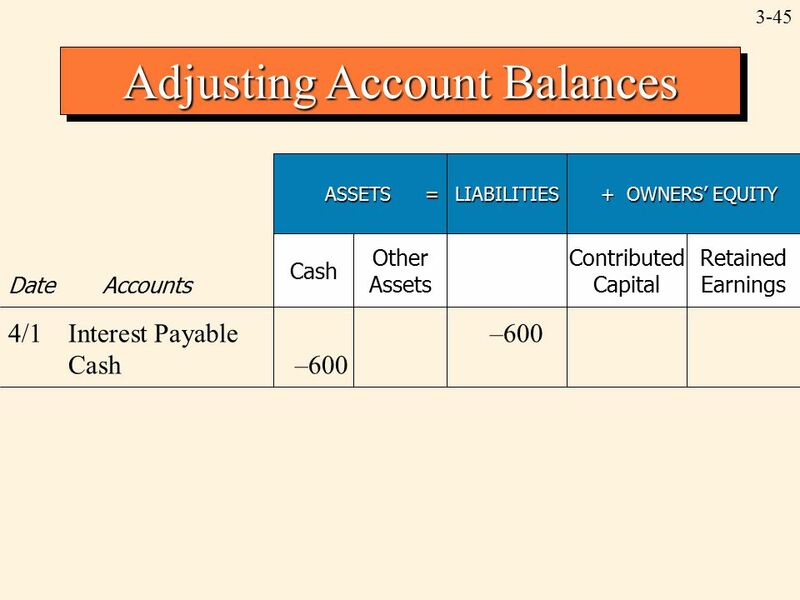 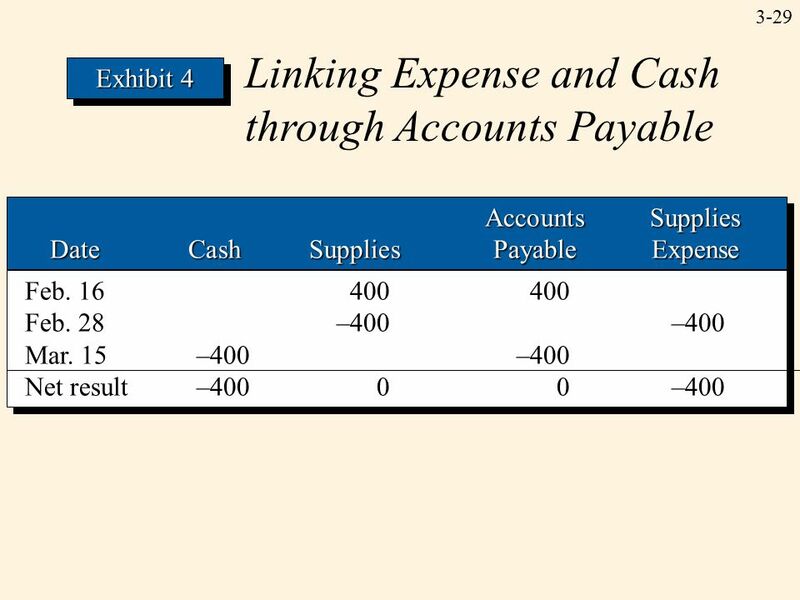 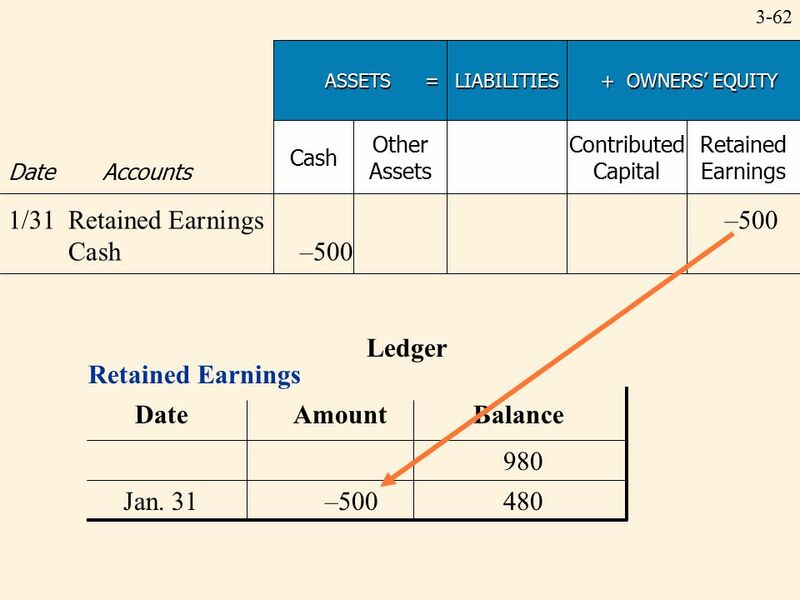 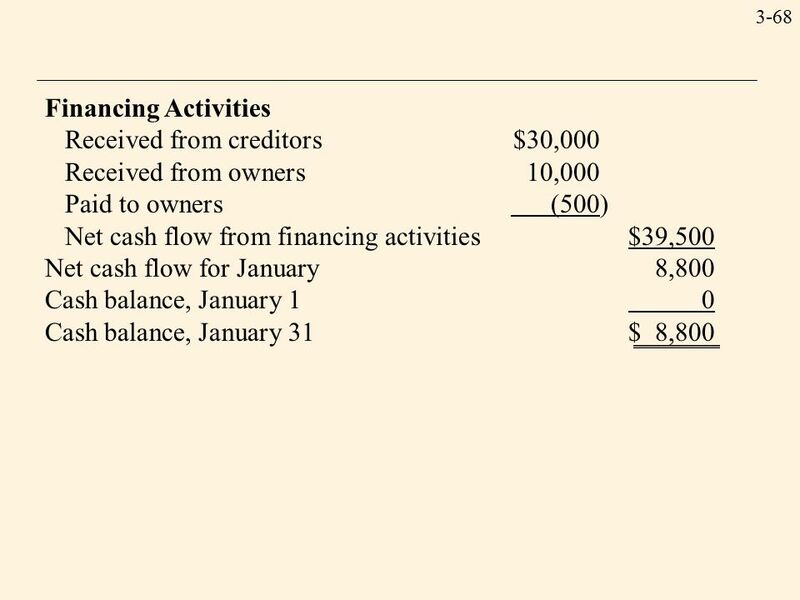 47 3-47 Adjusting Account Balances ASSETS = LIABILITIES + OWNERS’ EQUITY + OWNERS’ EQUITY Date Accounts Cash Other Assets Contributed Capital Retained Earnings 1/31Depreciation Exp.–520 Accum. 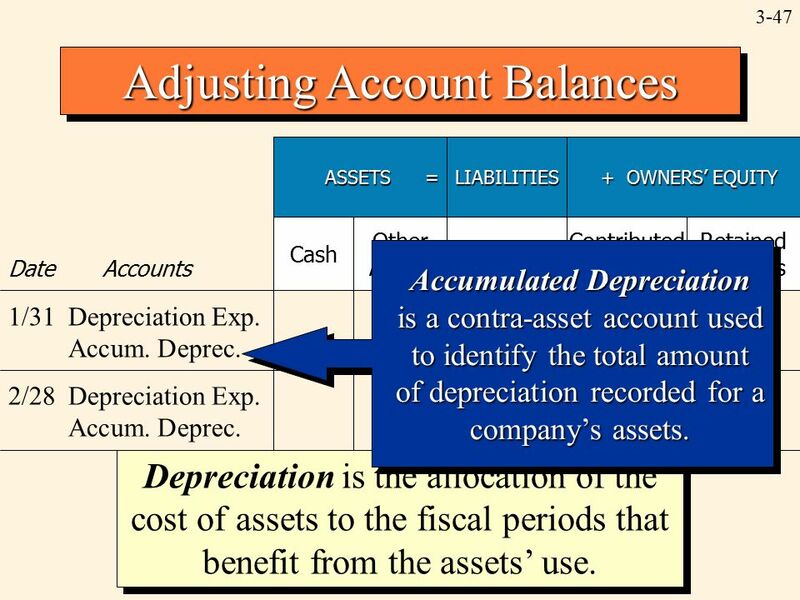 Deprec.–520 2/28Depreciation Exp.–520 Accum. 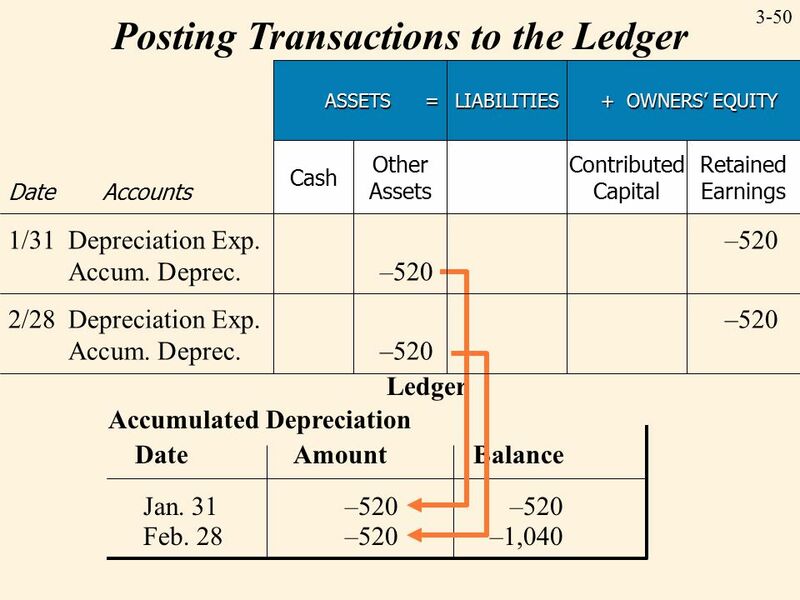 Deprec.–520 Depreciation is the allocation of the cost of assets to the fiscal periods that benefit from the assets’ use. Accumulated Depreciation is a contra-asset account used to identify the total amount of depreciation recorded for a company’s assets. 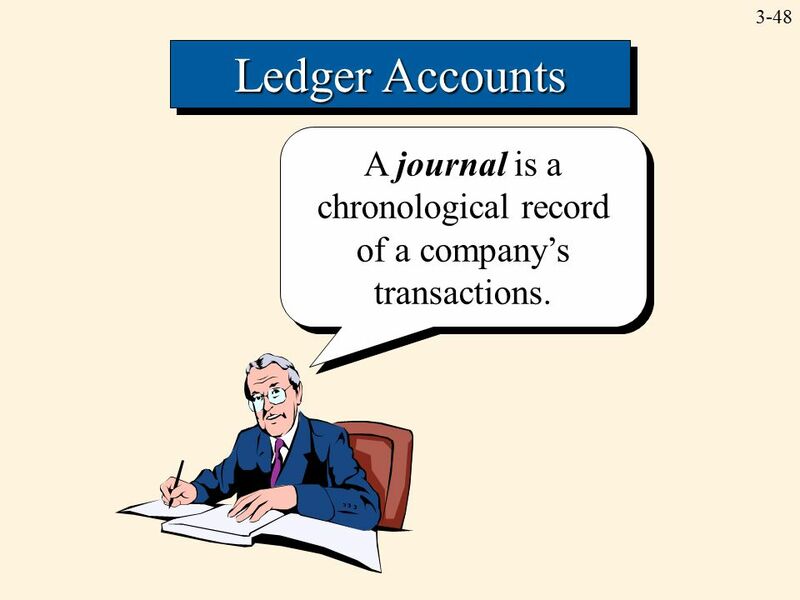 48 3-48 Ledger Accounts A journal is a chronological record of a company’s transactions. 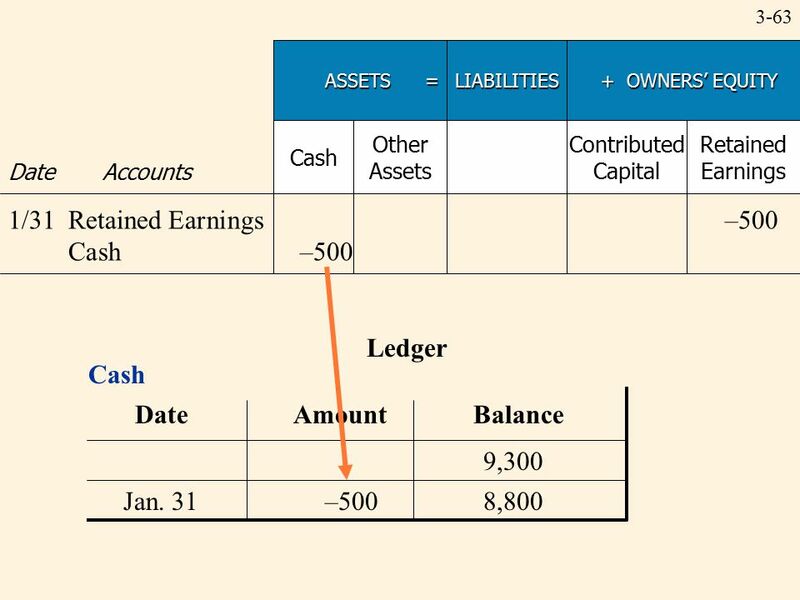 49 3-49 Ledger Accounts A ledger is a file in which each of a company’s accounts and the balances of those accounts are maintained. 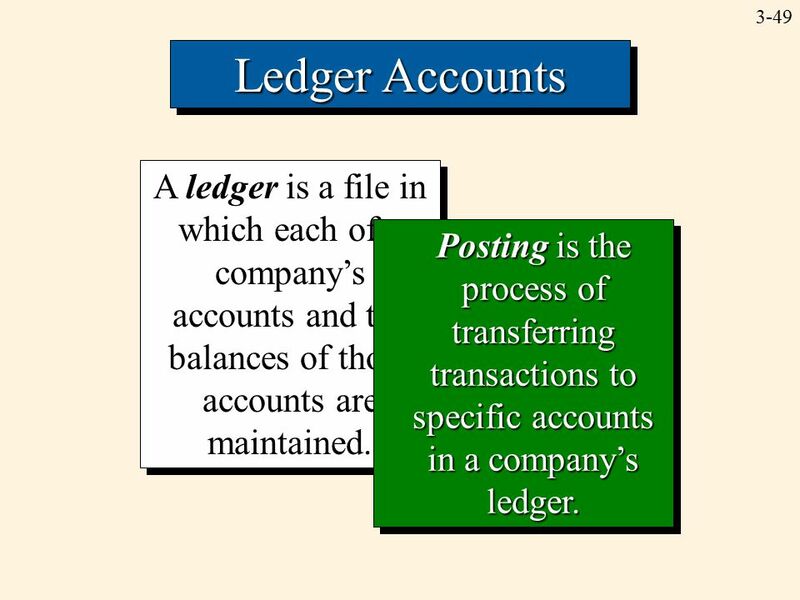 Posting is the process of transferring transactions to specific accounts in a company’s ledger. 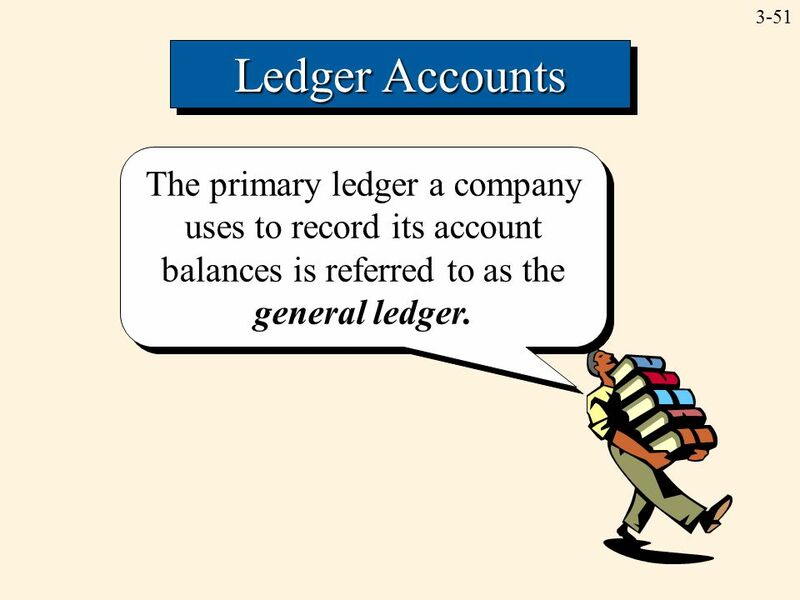 51 3-51 Ledger Accounts The primary ledger a company uses to record its account balances is referred to as the general ledger. 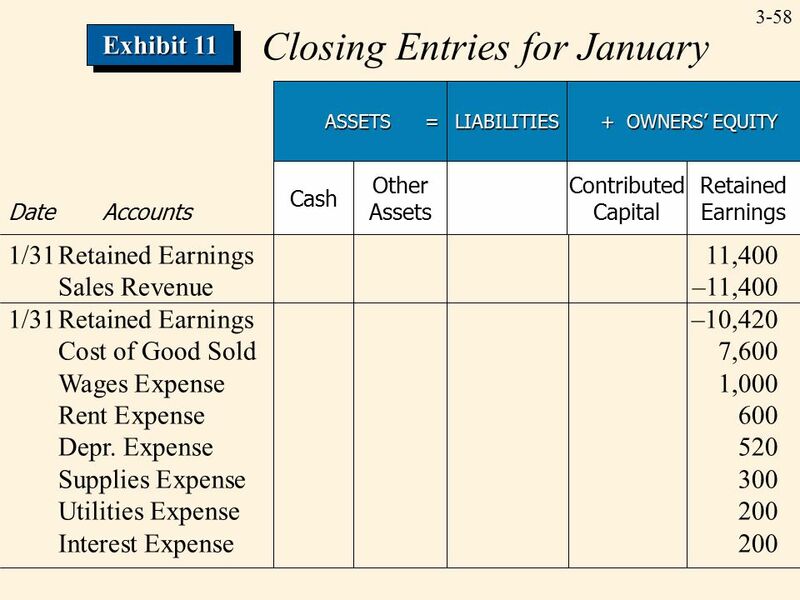 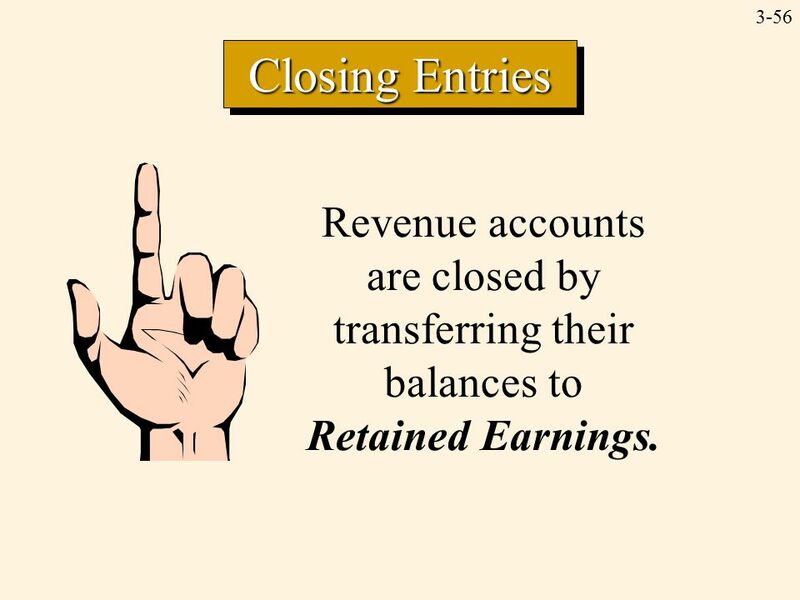 56 3-56 Closing Entries Revenue accounts are closed by transferring their balances to Retained Earnings. 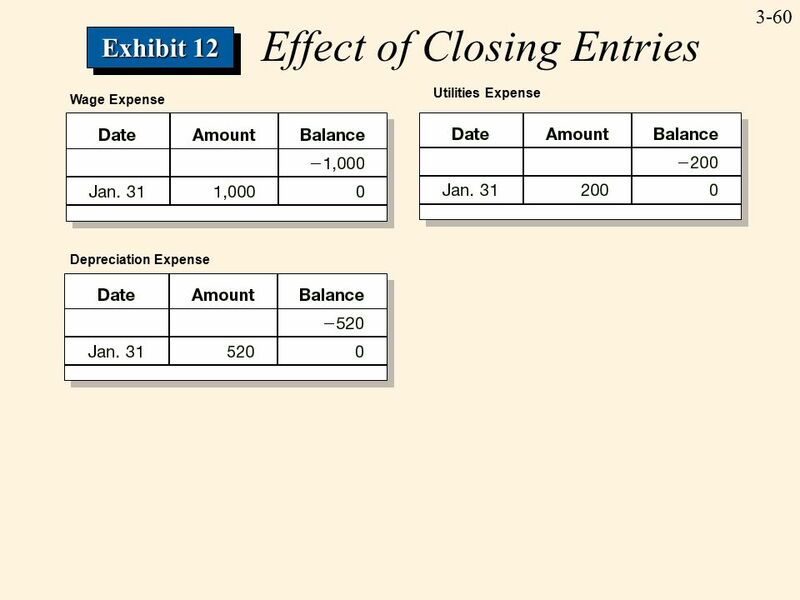 57 3-57 Expense accounts are closed by transferring their balances to Retained Earnings. 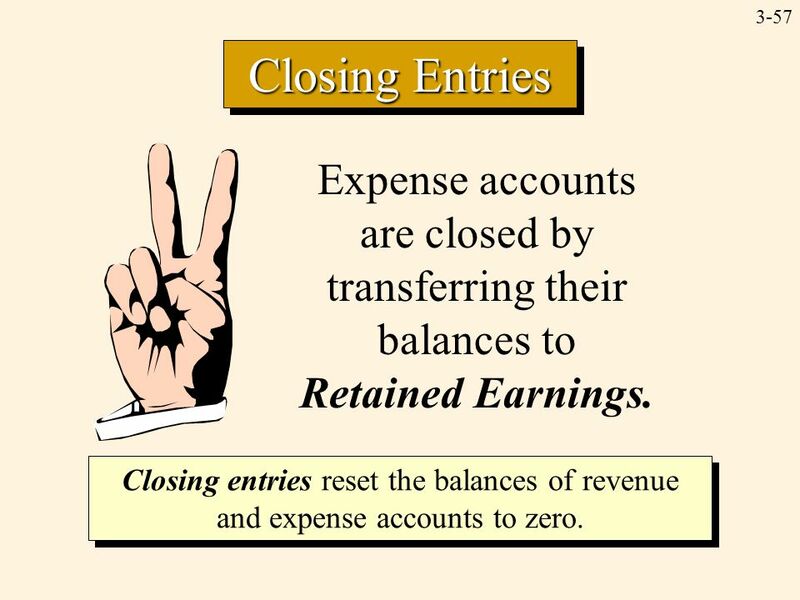 Closing Entries Closing entries reset the balances of revenue and expense accounts to zero. 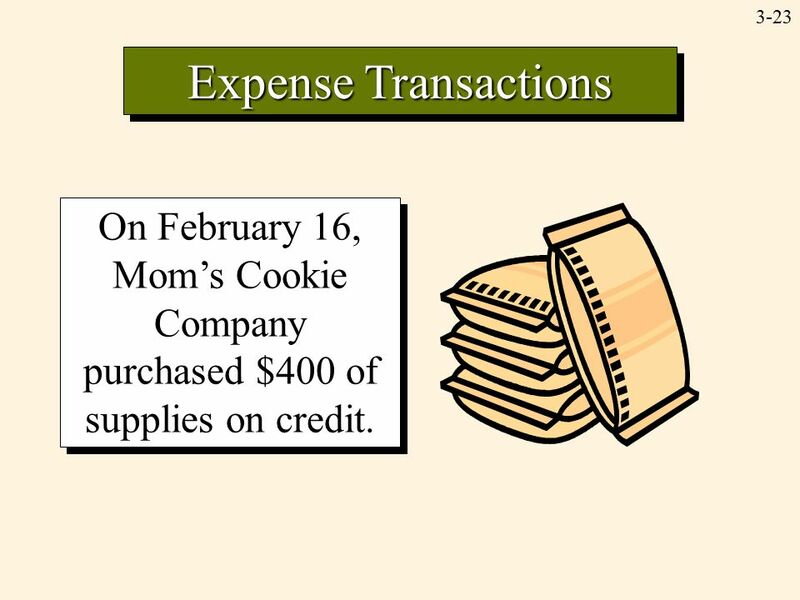 61 3-61 Payments to Owners Maria and Stan decide to withdraw $500 from Mom’s Cookie Company on January 31. 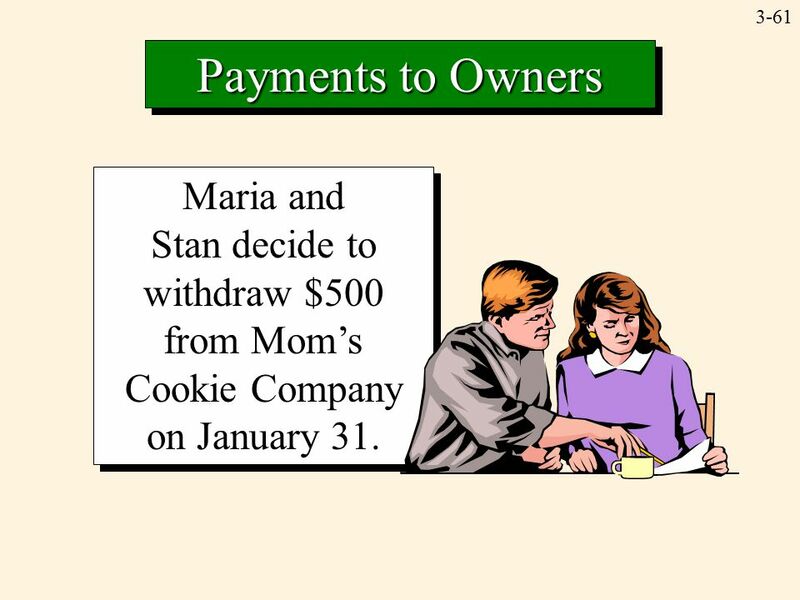 Maria and Stan decide to withdraw $500 from Mom’s Cookie Company on January 31. 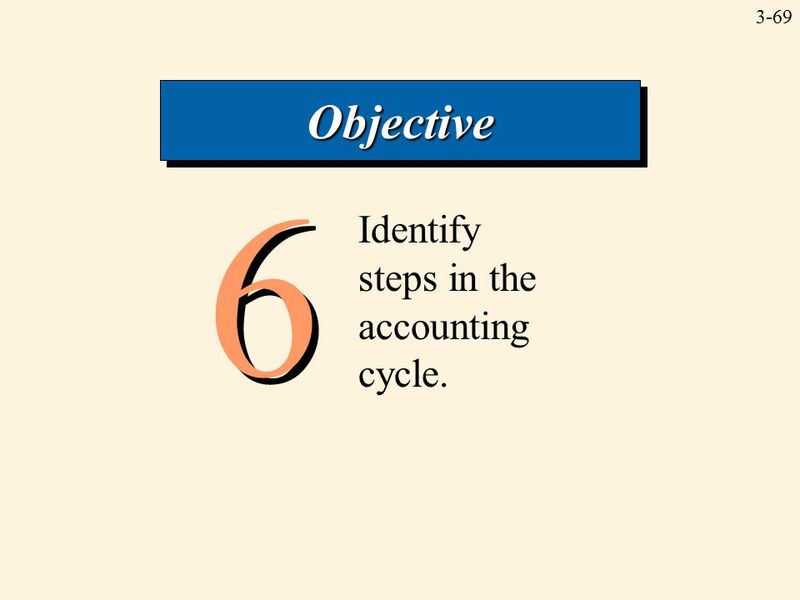 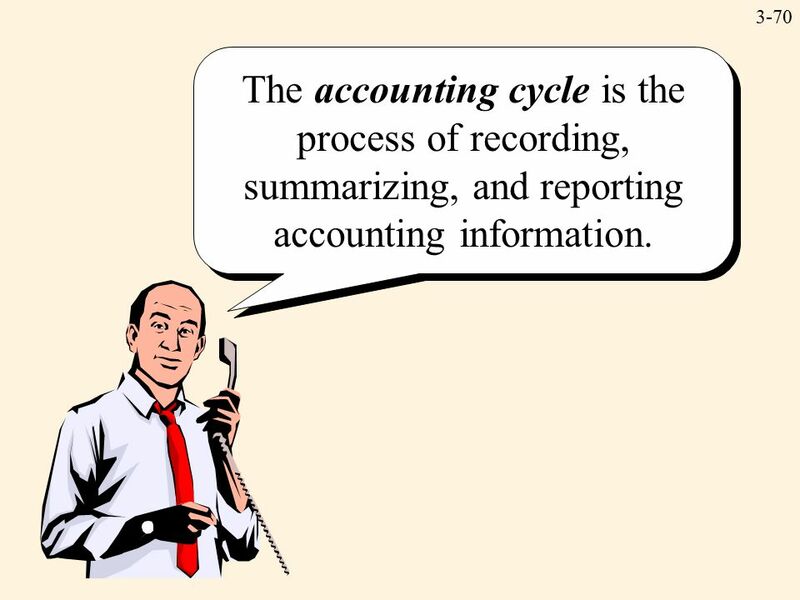 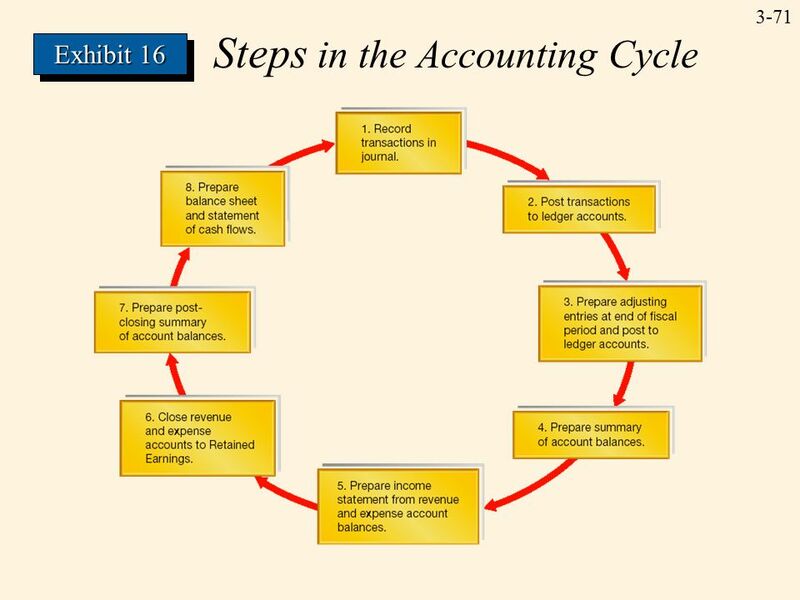 70 3-70 The accounting cycle is the process of recording, summarizing, and reporting accounting information. 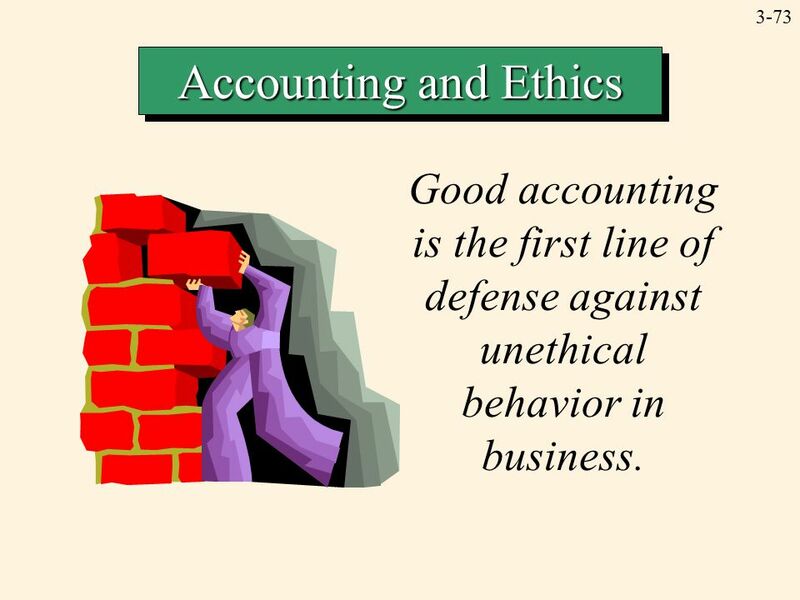 72 3-72 Accounting and Ethics An accounting system with adequate controls to ensure reliable information is expected by stakeholders of most companies. 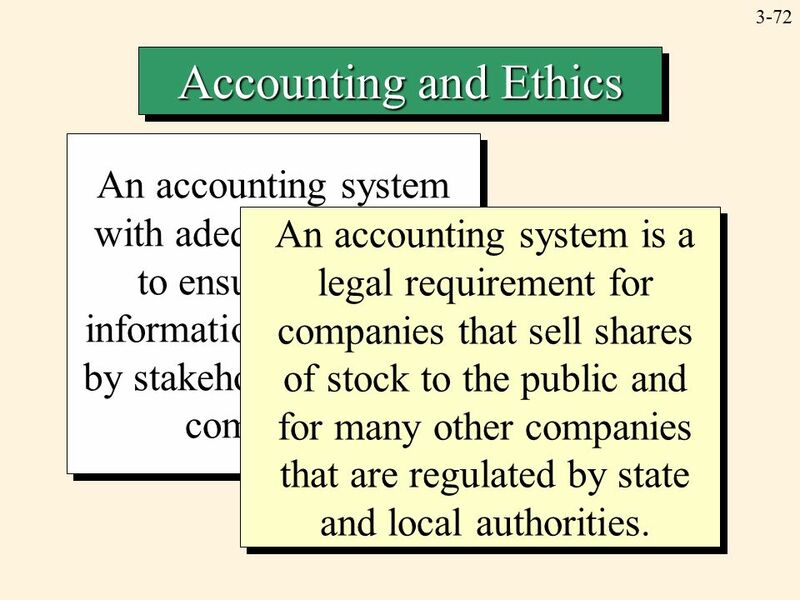 An accounting system is a legal requirement for companies that sell shares of stock to the public and for many other companies that are regulated by state and local authorities. 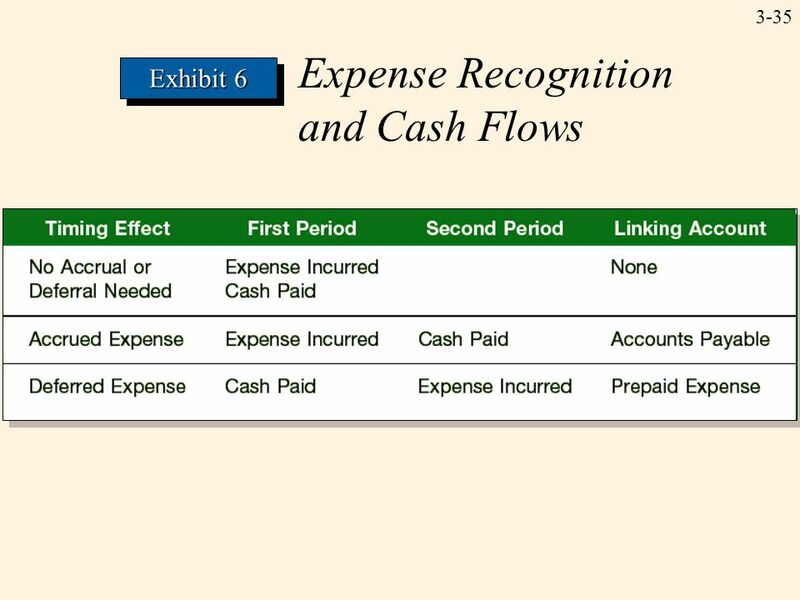 Download ppt "3-1 Measuring Revenues and Expenses Electronic Presentation by Douglas Cloud Pepperdine University Chapter F3." 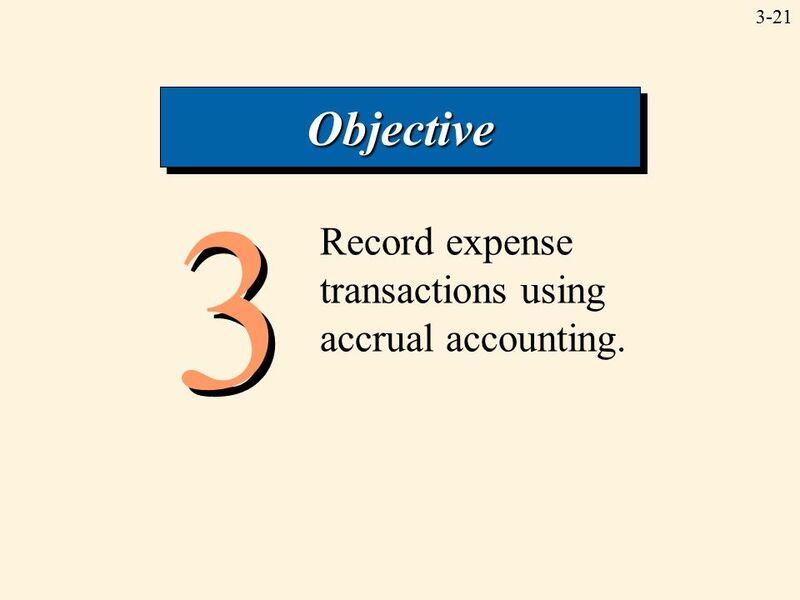 Chapter 3 Accounting Information System The Basics of Financial Accounting. 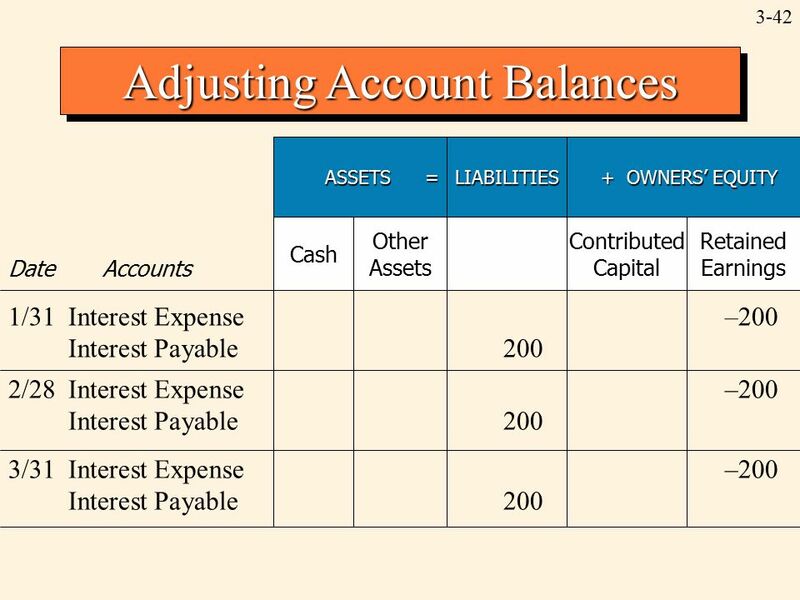 The Mechanics of Financial Accounting Presentations for Chapter 4 by Glenn Owen. 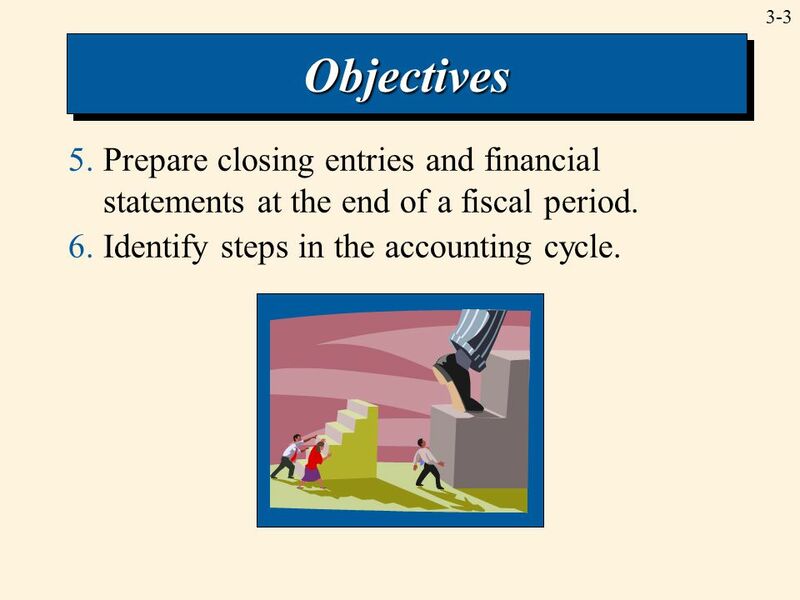 Chapter 4: Adjustments, Financial Statements, and Financial Results Learning Objective 1 Explain why adjustments are needed. 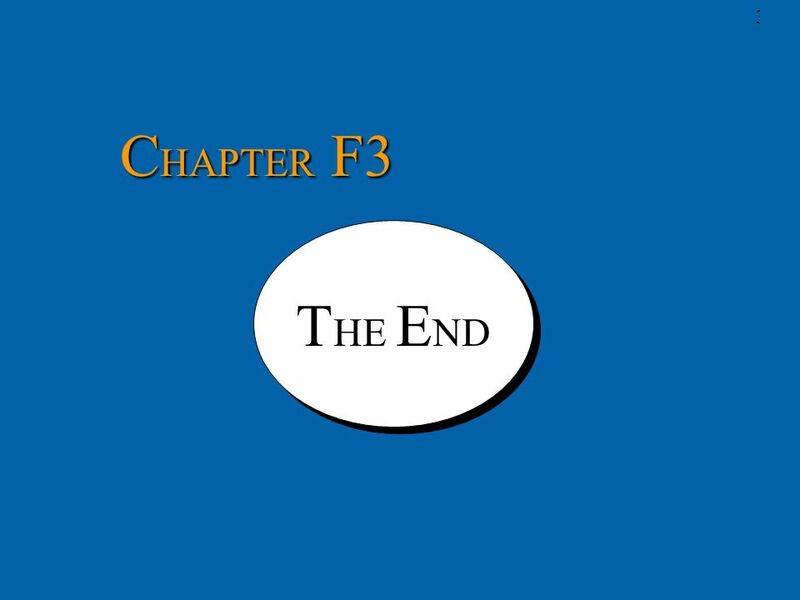 4-1. 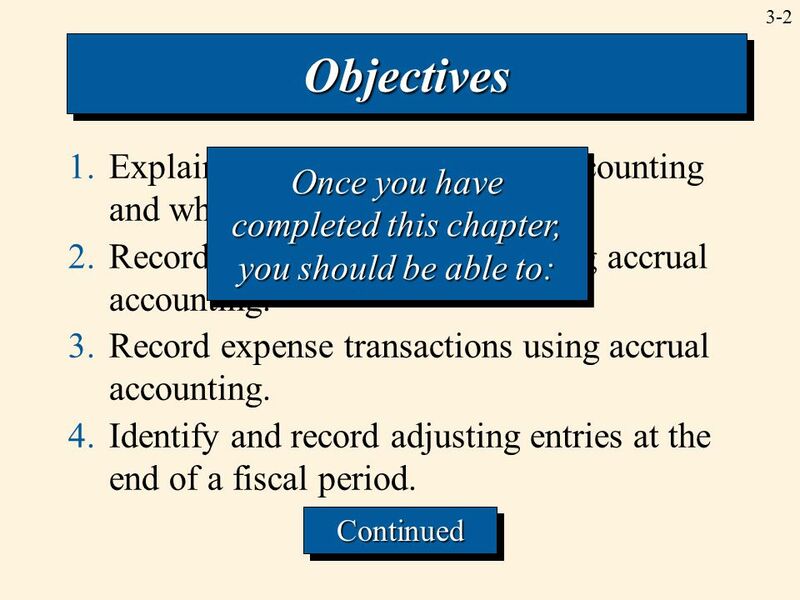 3-1 Intermediate Accounting 15th Edition 3 The Accounting Information System Kieso, Weygandt, and Warfield. 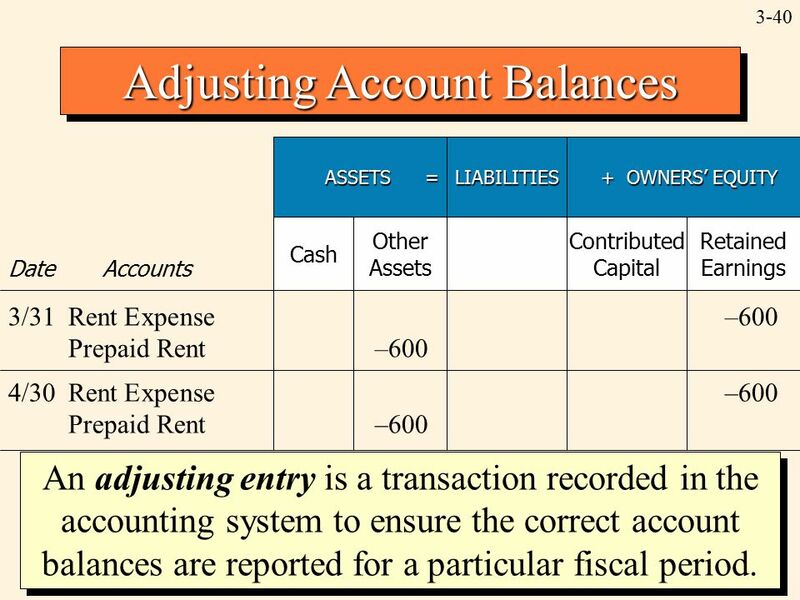 Question Answer Accounting I Debits & Credits Analyzing. 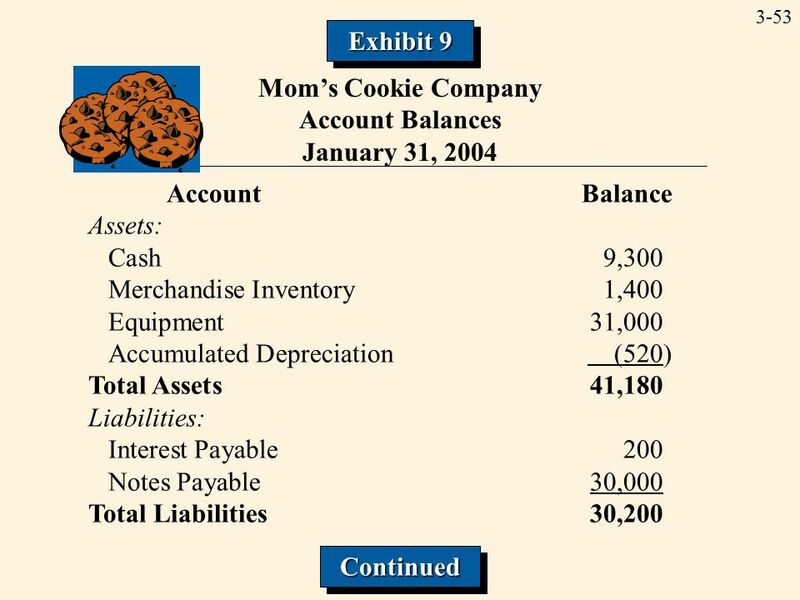 Irwin/McGraw-Hill © The McGraw-Hill Companies, Inc., 1999 Accounting Records and Systems © The McGraw-Hill Companies, Inc., Part One: Financial. 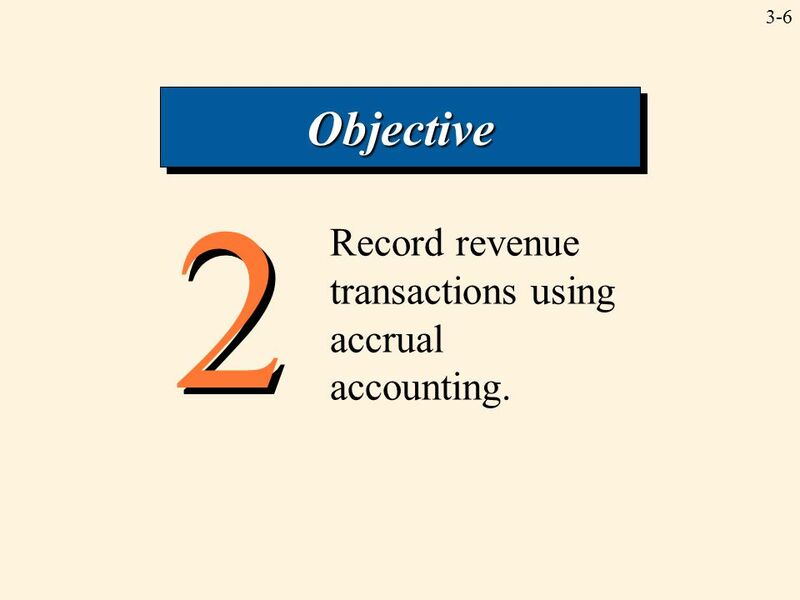 4-1 ECON 3A- UCSB Income Measurement and Accrual Accounting Income Measurement and Accrual Accounting Chapter 4. 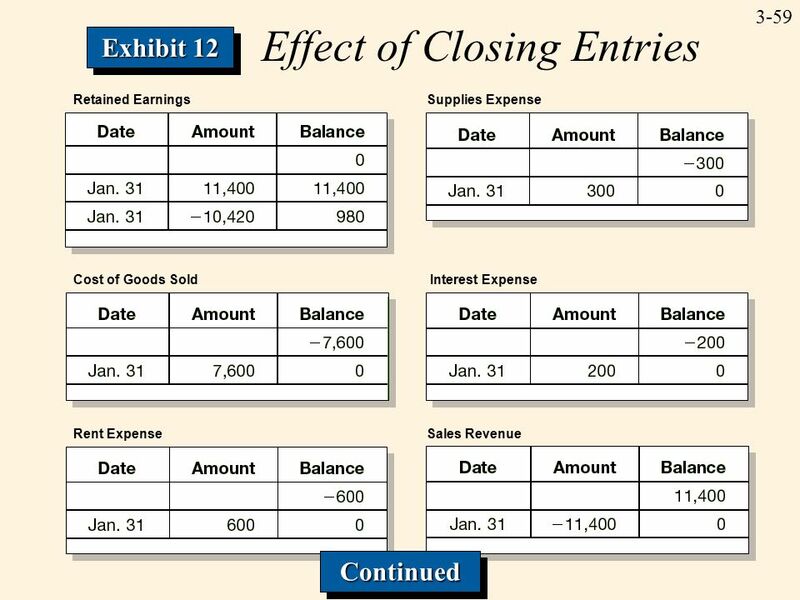 2-1 PowerPoint Presentation by Douglas Cloud Professor Emeritus of Accounting Pepperdine University © Copyright 2007 Thomson South-Western, a part of The.